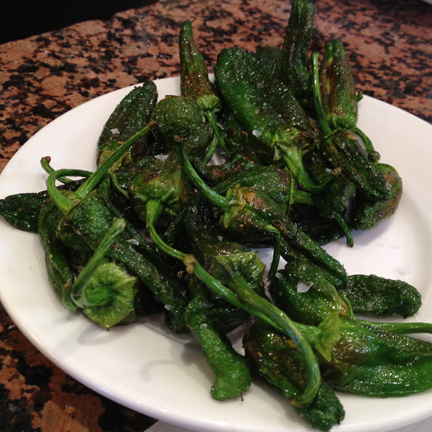 ah, our first stop in barcelona : cal pep. when erin asked for recommendations, cal pep came up a few times. so we knew we had to try it. a bit of info about cal pep : "cal pep presents a new way of cooking... our restaurant concept grew from the idea of sharing the dishes, their tastes & flavors, in a tapas-style. 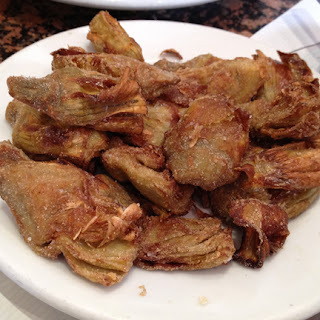 cal pep is authentic mediterranean cuisine, reflecting pep's personal style & incorporating seasonal ingredients... all prepared with pep's originality & flair." we <3 you, pep & team! we made two trips to cal pep ... the first one - my camera died. but fortunately, the food was so delicious, we wanted to come back anyway. here's a disclaimer, much like in my posts from mexico. i didn't generally explain that i was "vegan." i did more of a "hi, i don't eat meat, cheese, milk, eggs, etc." type of thing. so when it came to bread? no, i didn't ask. 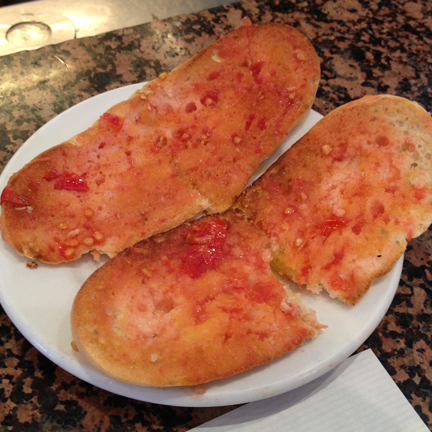 the bread in spain seemed pretty basic. no added extras. when it came to preparation, i asked pretty much everywhere. but as you'll see below - in the case of cal pep, there was a moment of non-vegan, but it was my fault. no worries. in my opinion, you gotta be flexible when traveling. bread w/ tomato & olive oil. fantastic & a major staple for me during this trip. no complaints. you wouldn't think it'd make that big of a difference, but smearing some fresh tomato on a hunk of fresh bread is just so.damn.good. 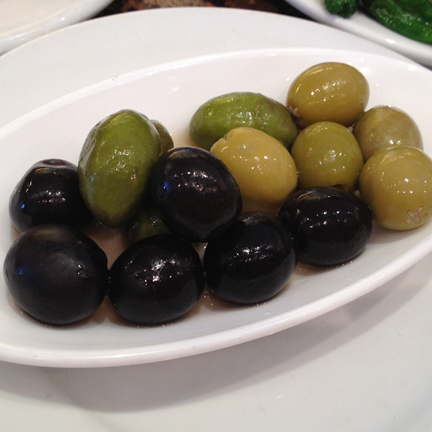 interestingly, on our first trip here, we were presented with a different array of olives. both versions were great, but the light green ones here actually had some sort of salty spread inside them. (maybe anchovies, gross.) blah. same issue with the fryer. but again, so tasty. these were also coated in some sort of breading (which i did make sure was a-ok). on our first visit, we also had some amazing sautéed spinach w/ chickpeas & a lovely bottle of vino tinto. overall, a fun place to eat. *note, there is no menu at cal pep. the servers just get a feel for what you like to eat & bring you stuff. so it's possible there are other potential vegan items here, i just didn't have them!